Barry Bonds missed the final three innings of Wednesday's game thanks to his first ejection as a hitting coach. He didn't miss any runs, though. Bonds' Miami Marlins mustered only five hits and lost to the San Francisco Giants 1-0. 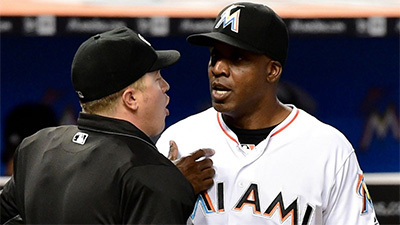 Frustration by Miami peaked in the sixth inning, when Bonds was ejected for arguing after pinch hitter Chris Johnson was called out on strikes with two on to end the threat.